Consultation with the client is the first step to get a feel for the space and the desired effect we want to establish. A rendering is then okayed before the work begins. 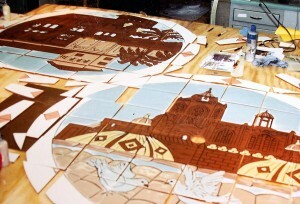 To create the tile mural, Carolyn first draws on tracing paper and then transfers the drawing to the tiles. The wax line work is applied either by hand or by silk screening. Carolyn often fires the tiles several times, and the glazes she employs cause the colors to change to a brilliant richness after the first firing. 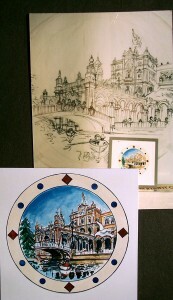 Carolyn likes to work in the cuerda seca method of a wax/oil line and raised glazes. The tiles can be permanently installed or installed on removable panels. The panels fit together and are caulked so they appear as one, but can be removed or sold as art separately if the home is sold. Payne Creations does not do permanent installations, but oversees the installation and can assist in finding a suitable installer. Payne Creations ensures that proper tile and materials are used for the application. Removable panels can be assembled in the studio and arrangements made for delivery. Murals: Price for murals is by the square foot and may vary depending on size and complexity of the project. Price usually varies between $125 to $200 a square foot. Deposits: I require one half of the price I quote you in advance. Payment of this deposit by check or money order must be received to confirm your order. If you would like to have a sketch to approve before the order is confirmed with your deposit, I require a 10% design fee of the total cost or minimum of $100 in advance which is non refundable. Shipping: Shipping and handling is a separate charge. I use UPS or freight depending on weight. Where do we start? Contact me by email or phone. When I have the specifics of what you are interested in, I will give you a quote. I need your approval of my design sketches before any work begins. The balance of your quote will be due upon receipt of your mural. Tiles: Included in your quote are my standard tiles. I like to use a 6″ x 6″, or 8″ x 8″ unglazed tile commercially manufactured tile. I find large tiles have a tendency to warp when going through several firings. The perfection of manufactured tile makes for ease in installation. I use either a frost resistant quarry tile or porcelain tile depending on the location. If you would like to use a different tile, the cost will be added to your final bill. My works are not transfers. You will see many designs on other sites for very little money that have been transferred, not hand painted, onto the tiles. “Sublimation” is one method of transferring images to tile. You will not achieve the look and feel of a hand painted mural with this method. 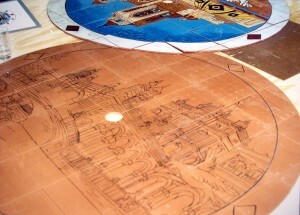 I like to use the cuerda seca method of a wax/oil line and raised glazes which gives the mural a rich texture effect.